The European Union donated EUR147 million last year for tsunami recovery assistance in Sri Lanka. Part of the donation made it possible for the International Organization for Migration to reconstruct an impressive EUR1.88 million Vakarai Maha Vidyalayam school building in collaboration with Sri Lanka’s Ministry of Education. This school accommodates more than 1,000 students and represents not only an educational commitment by and for the people but also a strengthening of the social fabric of the many cultures that are interwoven into the area. In recognition of its outstanding devotion to humanity’s wellbeing, Supreme Master Ching Hai conveyed the Shining World Leadership Award to the European Commission (EC). 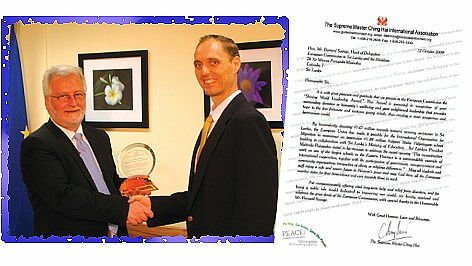 On November 11, Golden Year 6 (2009), representatives of the Supreme Master Ching Hai International Association traveled to Colombo, Sri Lanka to make the presentation to EC Ambassador Bernard Savage, who was delighted and honored to accept the Award on behalf of the Commission. He applauded the work that the Supreme Master Ching Hai and Association members are doing throughout the world and says it is very much in line with the European Commission’s vision and work ethic. The staff members at the EC were incredibly warm and helpful. They were very appreciative of the gifts of books, DVDs and vegan sweets from the Supreme Master. Mr. Savage’s personal assistant said the books would go into the Commission’s library for all to read. During an interview, the Ambassador also noted the many other activities that the EC is involved in, such as road rebuilding, sewage treatment plants, housing redevelopment, and social planning. He expressed time and again his excitement as well as feelings of worth and honor to be able to help oversee these Sri Lankan projects for the Commission and her partner states. May all students and staff enjoy a safe and secure future in Heaven’s grace, and may God bless all the European member states for their benevolence and care towards those in need.